OMG. This poor blog has been ignored. I blame M.O.V.I.N.G. I'm pretty sure I'm never moving again. Travis and I will DIE living in this house. My life has been CRAY CRAY ever since we closed last Tuesday. Ever since Tuesday, we have made countless trips from our apartment to the new house. The "big" stuff was moved on Saturday, thanks to a U-Haul, Travis, his 3 strong friends and my parents. Apparently, it takes a village....to move you out of your 1 bedroom apartment. We both have so much crap, it's pathetic. Spring break/summer project...here I come. I see lots of Goodwill trips in the future! This move has seriously taken over my life--I even missed my friend's baby shower! We are starting to get settled, but there is still more stuff at our apartment! Will this ever end?!?!?! The good news is that: 1. We booked our honeymoon! I'm so excited, I want to go now! And escape all of these boxes!! And 2. I bought myself a Dyson vacuum! Obviously, I know I am getting old when I get excited about a vacuum! But, it was on sale at Macy's, plus I opened a Macy's charge so I saved another 15%! And I want to keep our new house clean from the get-go!! I am soooo excited to vacuum now!!! And the sad part is, I'm not even joking!!! I promise I'll be back (hopefully) soon to post some new pics of the inside of our new house (can you tell this house has taken over my life?!?! ), but it's super messy right now, kinda embarrassing! 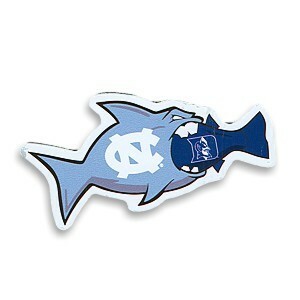 Gotta go watch those UNC boys whoop on Dook! We missed you at the shower but I'm glad that you had so much help to move! Moving is the biggest pain! I bet your house is starting to look great, though! Yay! I want to see it!